While a movie paying tributes to one of Nigeria's greatest soccer stars, former captain of the Super Eagles, Austin Jay Jay Okocha is receiving finishing touches in New York, arrangement has reached its peak for the shooting of a bio-pic on Nigeria's superstar reggae artiste Majek Fashek. Majek, described by his teeming fans as 'a prophet and a poet' is one of Africa's revered contemporary musical performers, rivaling compatriots Alpha Blondy and Lucky Dube in recognition and popularity around the world. 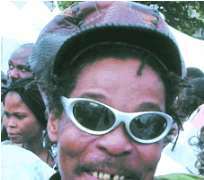 But like a candle in the wind, the reggae star has disappeared from the scene leaving in its trail, a permanent vacuum where a once blossoming musical career existed. The screenplay, written by cerebral and easy-going film producer, Charles Novia, is starring award winning actor, Francis Duru as Majek Fashek alongside Sam Dede, Stella Damasus and other top Hollywood actors. According to Novia, the movie, which he is shooting on 35mm and took about three years to finetune is presently at pre-production stage, after which the casts will travel to New York in October to shoot the American scenes that make up more than half of the movie. 'Whatever his travails and the public perceptions of him, Majek still remains a world class material, who has promoted so much interest worldwide with his genre of music. Therefore, a movie on his life and career has to meet world standard', Duru said.